Our Internet-based amateur radio training course launched in 2015 and is designed to help newcomers to get started in the hobby. We’ve now helped over 1,000 people to get started in amateur radio. Struggle to learn from a book? Our course is a little more interactive. The course is also useful for you if you can’t make regular courses, want to study at your own pace, or have a limited budget. Our course is free. Note: Those looking to get an amateur radio licence will need to complete the Foundation practicals with a registered assessor, and sit the Foundation multiple-choice exam at one of the many centres in the UK. Clubs and assessors around the UK can help with training courses, practicals and exams. Fees: We don’t charge for our online training courses, but the RSGB charges an exam fee of £27.50, and most UK clubs charge a fee for facilitating practicals and exams. This course is intended to complement other training in the UK, not to replace it. Our online course is split into nine modules, each one with a full walkthrough of what you need to know for the syllabus, plus a short test at the end to make sure it’s all going in. The online Foundation course is supplemented by downloadable material, videos and training slides, and much of the content is based on our popular (and free) Foundation Training Slides, as used by several clubs across the UK. We’re using an industry-standard Learning Management System (LMS) to deliver the course. Foundation Online has been designed by an RSGB Registered Trainer who has been involved with training for multiple amateur radio groups. Courses currently run once a month, starting in the first week. They typically run for 3 weeks. To help get newcomers into the hobby, we’re not charging for our online amateur radio training course. It’s free to join, and you don’t need to be a member of an amateur radio club to sign up. If you’re currently studying for your Foundation, or are planning to start learning, please enter your details below, and we’ll be in touch with details of the next course. Apply for Foundation OnlineIf you are interested in joining an upcoming Foundation Online course, please complete the following form. We will then send you our course summary, and ask you to confirm when you’d like to start. Please only complete this form if you are genuinely interested in studying online for Foundation and can commit to 2 hours a week of online study for 3 weeks. When & where are you planning to take your Foundation exam? Why are you interested in amateur radio? You will receive an automated email within 30 minutes. If you don’t see it, please check your spam folder, or contact us. If you’ve got a question, check our Foundation Online Frequently-Asked-Questions section. Hi, I’m Steph G4XKH and I’m a trainer/assessor at the Riviera club in Torquay. We love the idea you’ve come up with as we were thinking along similar lines ourseves as a way to bring training in to the 21st century. Could I get a look at your test area to see how you’ve done your material. I’m hoping it would give our training team some ideas. Hi there, I’m Mike M0AZE one of the trainers for Sutton Coldfield Amataeur Radio. Our pace of people wishing to enrol for the Foundation exam with the nice issue of following on for the Intermediate. I must confess to using your slides and apologise for not letting you know, I hope this corrects that issue now. I did notice in today’s Radcom you have introduced a distance learning package and I’d be interested to see if that is an alternative we could utilise to those who cannot attend our club? Hi Mike and thanks for getting in touch. Now worries re. the slides – great to hear that you’re finding them useful. Happy to let you have a look at our demo area and see if the course could be handy for you and/or your students. Drop me a mail via https://www.essexham.co.uk/contact and we’ll set you up with access. I Think this is a great idea as all my local clubs are having problems with the foundation training courses at the moment and it will really help my training kjust hope i can get some local help with the practical side now many thanks Graham. Thanks Graham – You now have the details and dates, so just let us know which course you want to start on, and we’ll get the ball rolling! I would be interested in seeing the material if possible as I am looking at ways to align training with the Sea Cadets to enable cadets to take the Foundation Exam if they wish to do so. Our radio training is very close to the RCF syllabus already. Many thanks, wish this was around when I was doing my foundation licence! Hi Stewart. Great – happy to let you have a look at our demo area and see if the course could be handy for you and/or your students, and as you say, the courses are broadly similar. Drop me a mail via https://www.essexham.co.uk/contact and we’ll set you up with access. I’m new(ish) to the hobby and had given up on the idea of ever getting my foundation. I couldn’t do the course at my local club as I work away and they only run the course over a series of consecutive week nights and being away I cant attend. I was looking for somewhere that ran the course over a few days but this seems to be an ideal solution. Now just need to get through it and find somewhere to take the exam – Thanks a lot for this. I’ve just finished the final module and the end-of-course mock with success. Thank you for letting me take this excellent Foundation Online Course 3. I intend to continue studying the materials of this course and some books that I orded a few days ago, such as Foundation Licence – Now!, Intermediate Licence, Advanced – The Full Licence, and Amateur Radio Exam Secrets, all published by the RSGB that I’ll be receiving them soon. Remember that I’m very interested in taking the Intermediate Course. Let me know, please. Our course allows you to study the material online in your own home at a time to suit you. You will need to sit some practical exercises and take the exam, normally with the help of a local club. If you want to join our online course, please fill in the details in our signup forum. Otherwise, see https://thersgb.org/services/coursefinder/index.php for details of clubs and training courses in your area. hi my name is Helen and at the moment I am studying to take the exam but I am disabled with cerapalsy which mean’s my memory isn’t that good and I can easy forget certain stuff that I have learned. is there a way I can remember what I have learned ready for the exam which I’m hoping to take very shortly. I’m not sure which ones would work best for you – I learnt using a combination of three of the above. It may be a case of trying a few different ways and seeing what works best for you. the only problem I have because of my condition not understanding the question they ask on a exam properly mainly ones that’s got to do with numbers or graphs. Would just like to say a big thanks to Pete M0PSX for running the online foundation course over the last couple of months. I passed my foundation exam on Oct 1st just after the course finished and I must say this course really did help, plus you had on-line materials to help you do a bit of re-visioning. Will let you know my call sign when I have it.. Many thanks Kevin – Well done on the pass. Guessing you now have your call and have started enjoying the hobby! My daughter Colette registered to take your course we have not heard anything yet? Notes here show that we replied in September. We require parental approval for learners under 16. Resent the details to both you and Collette for review. Hi, for my sins I am President of the Cornish Radio Amateur Club. We have recently held another Foundation trtaining course with an 80% success rate with just one failing to make the grade by one point! Out chief trained is now in his 70’s and, to have a premises suitable for training costs us £50 a session at the weekend so not feasible to offer a refresher for one candidate prior to the re take. I suggester to her that she should register with you but there sdeems to be some reluctance to do so, goodness knows why the more poractice the better. anywy, would it be possible to have a look at the course (don’t want to register personally as I have been g4usb for 30 years plus)to allay fears? Our chief trainer has been working on a course for training via disc but I think you idea would be more 21st Century. I applied for the online course yesterday but got no reply. Can you please let me know how to register for the online course and the time tables? Sorry… We’ve pretty busy with enquiries in the last couple of days, so couldn’t reply instantly. You now should have the details. Any questions, please get in touch. Is there any recommendation for classrooms with lab based training course on HAM radio certification for mid and advanced levels. I will be delighted if you can send me full details. 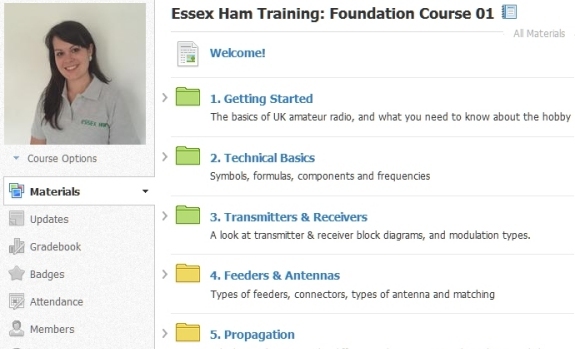 Hi recently completed Essex Ham Course. Would like to make a donation to Essex Ham in appreciation. I hold the call sign M3NDZ and looking to do an on line course for the intermediate licence, do you know of a club or college who might do an on line course or a tutor who is willing to help? I live in Stratford upon Avon and not a member of a radio club. I have tried to enrol on this course twice and entered details and don’t get a email which been told about starting training . What can I do I want to start in September . From our records, you applied first in April, and declined our May and June courses. You asked to join our July course, but didn’t start the course. We had no response to three chases from us in July. You have now registered 4 times in August. As other candidates seem to be receiving emails and have signed up to recent courses, this would seem to point to a possible issue with your email account. You may want to check your spam folder / settings to make sure we’re not being filtered out somewhere. We met at MARTS field week in August. Are you planning to do Intermediate online at any time? Just completed your excellent Foundation modules and also looking to the Intermediate. Do you have an expectation as to when the syllabus will be released? I assume you will only know how long it will take to produce the training, once the syllabus is released, given the rumored widespread changes? Just to say I finally found a club to complete my practical sessions with so I am all set to sit the exam (all booked) in December – right on the 6 month limit you set! I really appreciated your course which made the theory so much easier to grasp. No problem – we’ll help if we can. It sounds like you were just one mark away, and I’m sure our course will help fill in any gaps for you. If there’s anything we can help with, just let us know. Can you please record the classes from here and make it available online? So we can watch it online without registering for the course here? I am a visitor in the UK and want to get the course completed asap and give the foundation exam in Jan.
Hi I suffer from dyslexia and I don’t always find it easy to work in an environment where there are other people so I am interested in doing my foundation course with Foundation Online. I do have some knowlage of electronics as back in the 1980’s I worked as a television engineer for a number of years I have never been great on the theory side of things though as I do have learning problems so I think your idea is a really good one. Regards, Ian. Do you have an intermediate course? Many thanks for you getting back to me so quickly with such a choice of information – now I can advise my friend about the foundation course. He is really keen to get going and hope soon he will have his full licence. Thanks again and I think the HAM TRAIN that you have set up is definitely on the track for a wonderful success story. Best 73s. GM0 EWW . Just wanted to say a big thank you for the course which I took in December 2017. Last week I took my Foundation exam with the Sale Radio Club in Cheshire where I was told I had passed and am just waiting for confirmation. The training material was first class along with the ability to measure your performance at each stage along the way with a quiz at the end of each module. I shall be recommending this course to any new members who join our club. Many thanks 73 Chris. No problem. Please complete the registration form (if you haven’t already). You’ll be sent an email with course details, and when you’re ready, drop us an email to confirm which course you’d like to join. Really useful course with professional content. Well done to Pete and the team. Hi everyone on Ham Train, I am GM0 EWW and have been on radio now for nearly 30 years. I am with the Lomond Radio Club, and have spoken to one of the assessors who has said that with my full licence and experience that I could also become an assessor with the club. Is this correct and how do I go about doing so. Would I have to do a training course etc. Thank you for your feedback. 73s John.